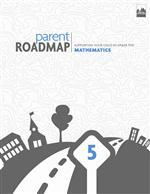 The Council of the Great City Schools' parent roadmaps in mathematics provide guidance to parents about what their children will be learning and how they can support that learning in grades K-8. These parent roadmaps for each grade level also provide three-year snapshots showing how selected standards progress from year to year so that students will be college and career ready upon their graduation from high school. ***The Parent Roadmaps to the Common Core State Standards may be reprinted or posted online for non-commercial purposes without the Council’s prior consent. Please include attribution to the Council of the Great City Schools.